Living at a place that is surrounded by water has made me constantly longing for fish and seafood. 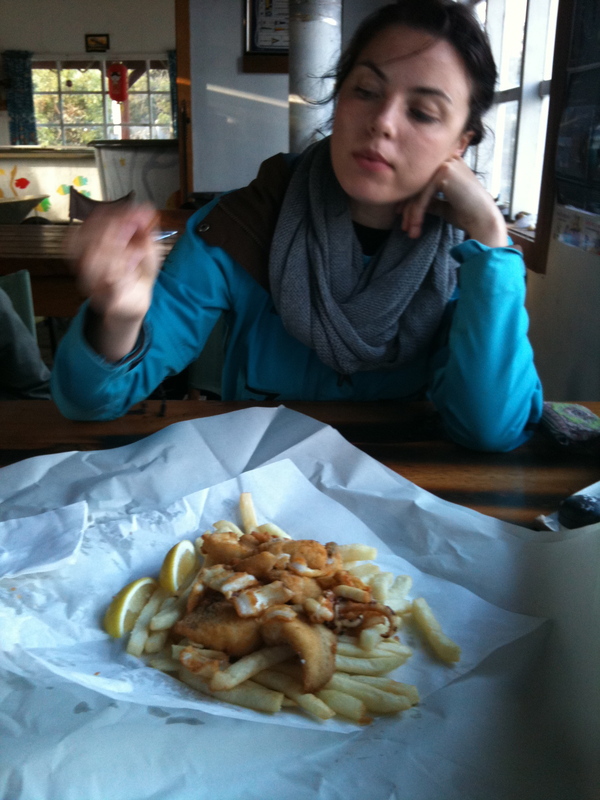 Don’t ask me why, but as London converted me into liking battered fish and vinegar on my chips, I just can’t get enough. Luckily my prays were answered when driving back from Port Arthur the other weekend. On our way back to Hobart, someone had recommended us a restaurant (or a local fishery to be more precise) the day before, situated in a tiny place called something on D (I can’t remember the name, not even sure it start on D) that consisted of a hotel restaurant/bar and three kiosks weirdly selling warm food over the counter. Oh and the fishery of course. Not having much else to offer and as the perfect tourists we are, took a left, following the sign “The best fish and chips”. Normally I would hear load warning signals in my head when reading something like this. Having done my fair bit of travelling, I’ve never encountered a place that would live up to such a strong statement. If you’re good, you normally don’t have to brag about it. However, on Tasmania it is different. Entering, thorugh the door made up of plastic strips, the place with no fresh fish what so ever in the deli, we thought we had come to the wrong place. Even more so when the owner, in his yellow fisher pants (the exact same the old man on the Fisherman Friend’s packages is wearing) totally ignored us, when we’re irrationally are trying to reach a decision of whether to eat there or not. Trying to please everyone in the group (1 not eating fish, another one not being impressed of the simple and rustic interior, another one thinking it was expensive and lastly, one starving to death and totally fascinated by the authencity of the place (=me) it took us some time. However as the owner finally also reached a decision (as we are still trying to reach ours) not to ignore us anymore, surely says: “Please let me know when someone has decided to speak to me” and wondered off into the kitchen (aka the open space behind the counter where everything from the fish got rinsed to the fishing equipment being stored). Hadn’t it been the pictures showing the three different platters you could get, we would never had thought we’d come to an eatery, let alone a place where someone would actually be service minded. After the rude encounter with the owner, we decided to hit the road and look for another place, but the harsh charm of the fisherman (or just the lack of better options) snarled us back. Oh, and it was so worth it. It looks simple, but it tasted great! Also outside of the windows you can see behind Caroline is the water, where we saw a sealion swim around. Unfortunately I didn’t manage to get a picture. The only picture I got was one of a dead seal that had been washed up the shore at another place. But hey, I guess that one alive seal makes up for one dead. However being a bit more serious, I did hear some unpleasant things about salmon farming in Tasmania (and around the world like in Scotland i.e). It is not good for the seals and not good for the ocean. The excesive feeding of the salmon pollutes the sea and the attractive and sedusive fish lures the seals trying to (and succeeding sometimes) to get through the net of the basins, with the result of either trapped, injured or dead seals. Read more about the impacts of salmon farming here. The seal below has not died from this, but either way this is how dead seals look like. Posted in Tasmania, UncategorizedTagged Australia, Fish and chips, food, fried fish, salmon farming, sea lions, seafood, seals, TasmaniaBookmark the permalink.